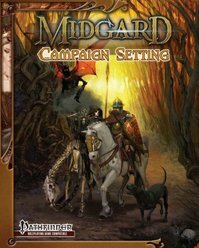 The release of the Midgard Campaign Setting by Kobold Press brings a major expansion of the AGE System: 26 new backgrounds, 3 new schools of magic, and many new specialties from the dark fantasy world of Midgard. Read on for the highlights of this new book by Wolfgang Baur, Jeff Grubb, and Brandon Hodge, along with links to download two 2-page spreads, straight from the interior of this gorgeous color book! There are 26 new backgrounds to choose from, and here are the Top 12 as voted on by…well, nobody. We just thought they were especially cool. Arbonesse Exile: An elven wanderer, exiled from the elflands of Arbonesse. Tough bastards with a certain gloom about them. Bemmean Arcanist: Human wizards of the high-magic magocracy of Bemmea. Often practitioners of the new schools of magic in Midgard. Collegium Apprentice: The Zobeck collegium teaches clockwork wizardry and star magic; even its apprentices are dangerous. Dragonkin Edjet: The dragonkin are heavy, clawed, dangerous folk, and the edjet are their stormtroopers. This is a brawler. Dust Goblin Dune Trader: The Wastes are full of living horrors, and dust goblins know how to survive them and dig valuable ancient artifacts out of the sands. The Gearforged: Once living, the gearforged now inhabited mechanical bodies of clockwork, gears, and a captured soul. An unusual race that lives to the ticking of a different sort of heart. Kariv Wanderer: Nomadic folk living under the curse of generations, the Kariv are rogues and horse thieves—and oracles and brave lovers of the open road. Khazzaki Nomad: Horsefolk with bows and grit, the Khazzaki spit in Baba Yaga’s eye and curse the Dragon Empire slavers. A nomad with style. Tintagerian Hellborn: The offspring of devils and humans, the hellborn have infernal abilities and strength but are widely hated outside their home city. Triolan Corsair: Midgardian minotaurs are often sailors and fearsome pirates. The Triolan navy uses them as shock troops against their ancient enemies in the Dragon Empire. Trollheim Reaver: From the land of the ice and snow come the dwarves and their raven-prowed ships, the reavers of Trollheim. Known for lightning-fast attacks and two-handed axes. Windrunner Elf: Nomadics and half-aerial, the windrunner elves are creatures of the open plains, with the eyesight to put an arrow through a weak link of chain at 500 paces. Not enough? The other new backgrounds include lightfingered kobolds, centaurs of the steppes, diabolical gnomes, scholars of ancient days, outcast trollkin, and more. Arcane Adept, the Artificer, the Scrivener, and the Star Mage are all Arcane specialists of one kind or another, and their names tell you much of what you need to know: whether they’re building constructs, deciphering the mysteries of ink magic or calling upon the magic of stars and shadows. The Harem Assassin is a charming rogue, the Shapeshifting Berserker is a skin-changer out of Norse myths and history, and the Spymaster is exactly the duplicitious master of deceit you would expect. Lots of new options here for advanced characters! As you might deduce from the descriptions above, the new schools of magic for AGE are Shadow Magic, Clockwork Magic, and Ink Magic. Each is unique and brings new powers and new options to your game. Do check them out! You can find the Midgard Campaign Setting in PDF, hardcover, and softcover at better game stores everywhere. Expand your Dragon Age boxes across the shadow roads and into Midgard!